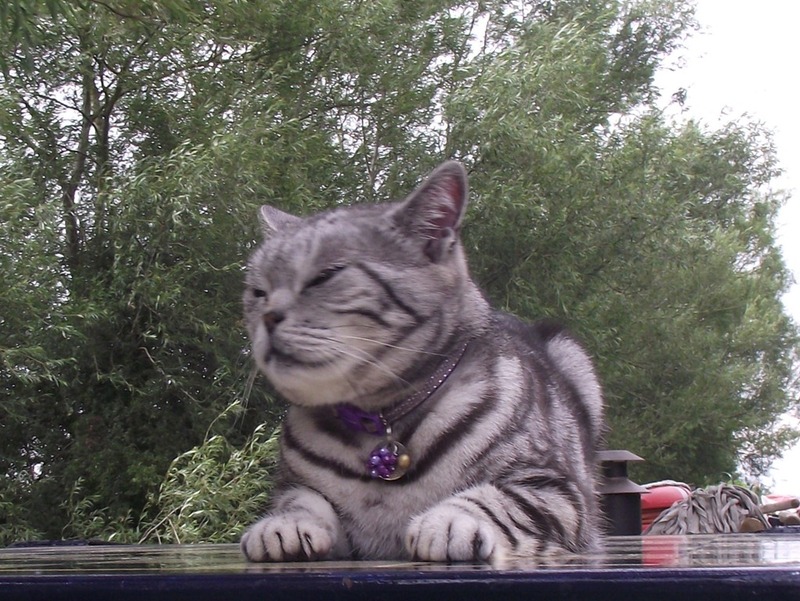 Our trip back to Heyford went well, we had planned to go Friday but the weather forecast was foul so we left a day early and made the journey in good time and found a free mooring opposite the church with satellite TV reception and some kind of internet signal. We had just settled in when a voice called “Hello” and our friend Emily stopped to chat and volunteered to run Joy back to Thrupp to collect our car which saved us a bus journey. We have a family of moorhens with three chicks here who were brave enough to come and be fed, when the ducks didn’t try to chase them off, moorhens are much better mothers than ducks and feed the food to their chicks instead of scoffing it all themselves. 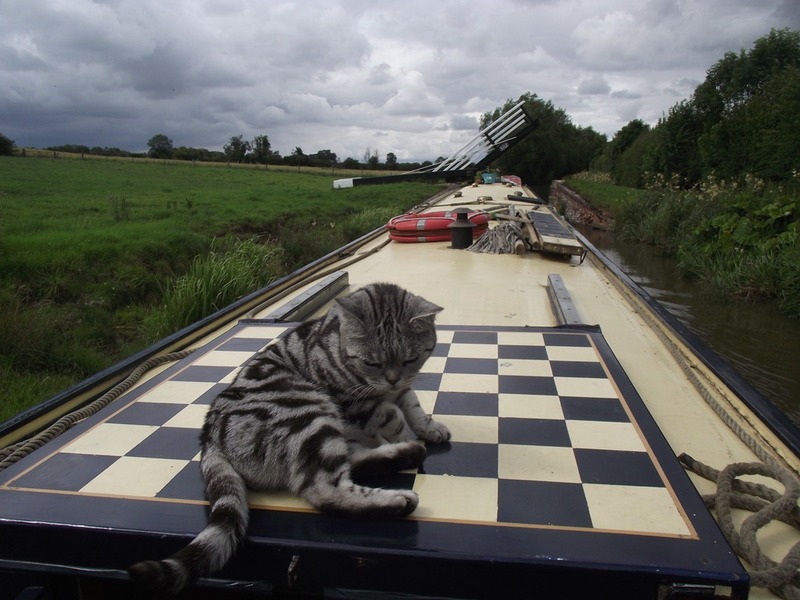 Bones arrived about midday Friday; she says she likes boating in the rain [weirdo! ], Dave P also happened along at the same time and the two drowned rats shared some hot tea and cold lunch. The afternoon involved more car shuffling, tea at Annie’s Tea Room and a peek at Bone’s Bantam, that’s a 1950’s motorbike (my first bike too) for the uninitiated! In the evening we were dragged off to the Bell (quelle domage!) where we met ‘Lady Muck’ (Canalworld Forum) and Josh from nb Rallentando who are visiting the South Oxford canal. Catty has been allowed out to play here and showed her appreciation by delivering us a present of a mouse! We enjoyed our stay by the Jolly Boatman, Not only did we enjoy a few drinks there with friends, but our week turned out to be quite productive. Our neighbours Alex & Helen who were painting their boat when we arrived inspired me to touch up the paint on the towpath side handrail, carried away with this, I then painted the newly fitted vice and serviced the engine. Whilst searching my workshop for the spare oil & filters I discovered a whole lot of ‘stuff’ behind my toolbox which I had forgotten about and set to finding homes for it. This developed into fitting shelves into a couple of the back cabin lockers, buying a couple of new storage boxes and fixing up hooks to hang spare wire, fan belts, oil measures, soldering irons and all the other necessities required by an engineer. Not content with that I invented an extra flap on our bed to help fold the mattress away, carpentry no less! On the domestic front things were not idle either. When we bought our boat the settee was covered with a rather plush red throw, in fact a couple of duvet covers padded with folded duvets which while looking good ‘in-situ’ had the infuriating habit of slipping off and looking a complete mess! Joy was discussing this problem with Helen who, not knowing Joy’s sewing skills, said “Why don’t you make covers out of it for each cushion” and on being assured of Joy’s lack of aptitude in this area volunteered to do the task herself on her sewing machine! [How many people have a sewing machine on board their boat?] The result is a resounding success and photos will follow when we have a better internet connection. 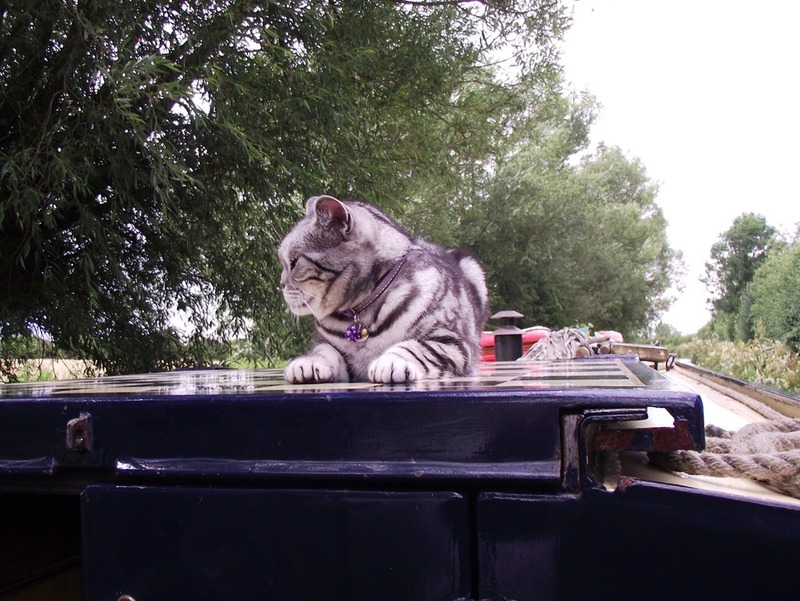 It’s nice to make new friends as we cruise up and down the canals and we shared a barbeque and many chats with Alex & Helen before saying goodbye on Thursday when we went our separate ways, them south, headed for the Thames and us north back to Heyford. 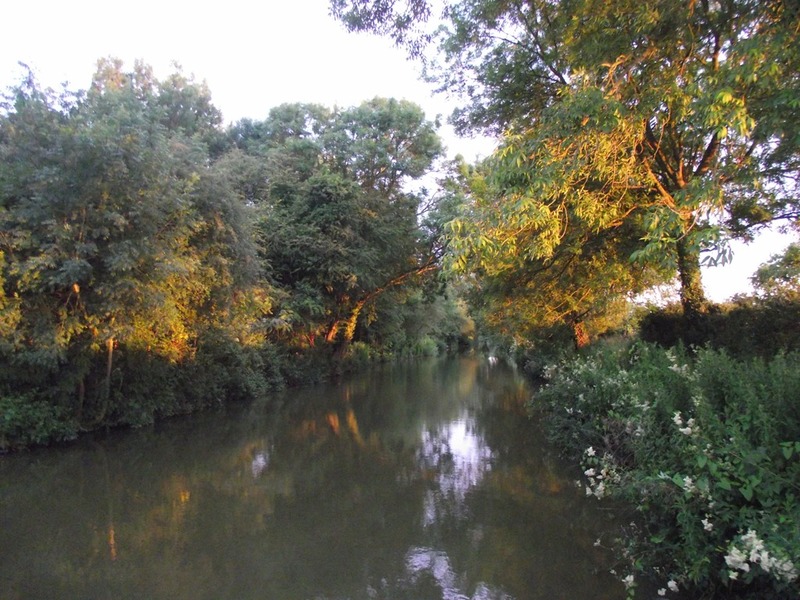 After a few days in the shady suburbs, on the 7 day moorings near Frenchay Bridge we took our leave of Oxford on Wednesday and headed northward once more. 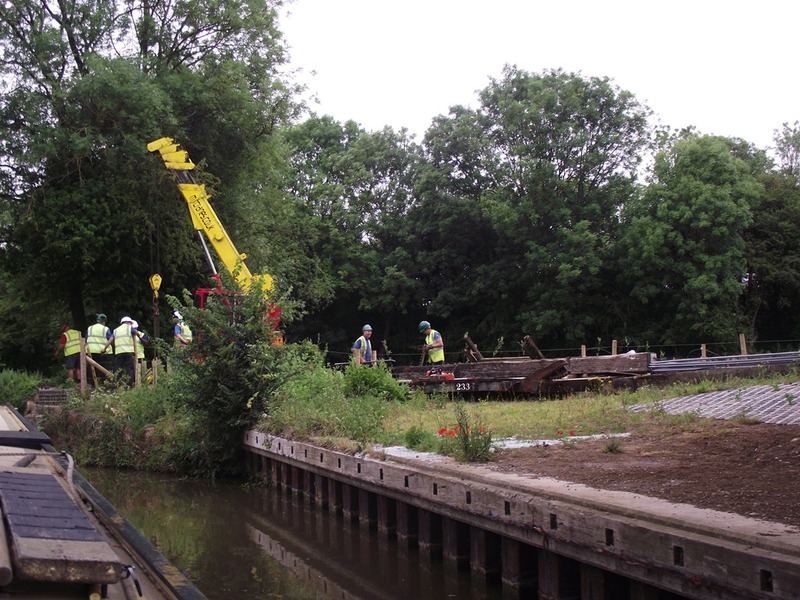 We had found that the moorings were a bit shallow there and some mornings we wondered if we would get off as the boat was starting to list a bit, of course, the two best moorings were taken up by BW workboats! In the event we got away without any bother, leaving our Kiwi neighbour on Brogan’s Run who had no such problems with his ‘plastic’ cruiser. Whilst we were there Catty managed to escape and went off exploring the neighbouring gardens which she found was a Bad Plan as she strayed onto the territory of two other cats who cleverly trapped her behind a fence and she had to cry for mummy to rescue her. Joy had to knock on the front door of the house and the lady let her through to the garden to retrieve the wanderer! 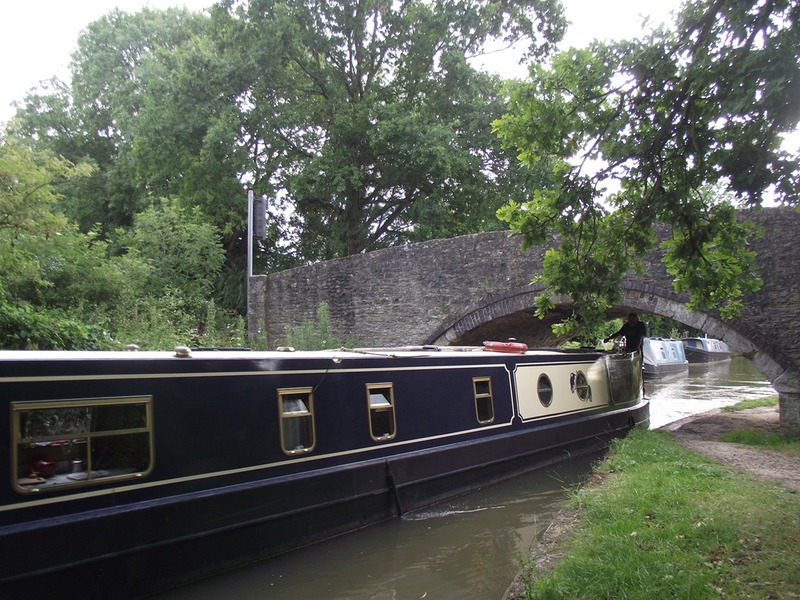 We thought that we would make the return journey in easy stages and one stage was easier as BW had removed bridge 233 for repair, we travelled back as far as Kidlington Green lock where we found a pleasant stopping place just above the lock, which was very peaceful. We caught the bus and collected our car from Thrupp so that Joy could go to her watercolour class at Upper Heyford whilst I went shopping in Bicester, we had a picnic lunch and visited friends in the afternoon before returning to the boat for dinner and then returning to The Chapel – Heyford Park for church that evening. Yarnton Bridge is a tad low! 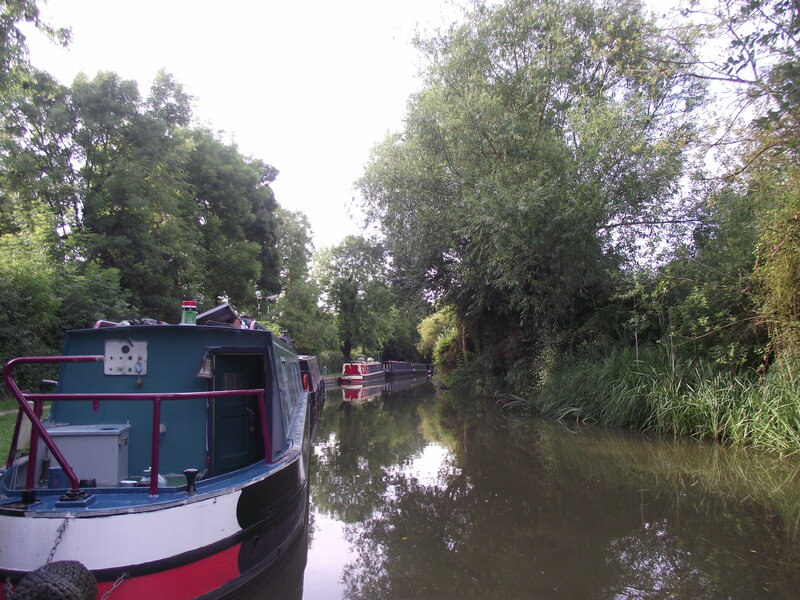 Yesterday (Friday) Joy took the car back to Thrupp whilst I took the boat back singlehanded and was fortunate to meet a boat just leaving Roundham Lock and another waiting to enter it as I left (couldn’t have planned it better!). We were also lucky with finding a mooring too, right outside The Jolly Boatman, thanks to Alex & Helen on nb Polly-Helen who left off their painting to move their boat and shoehorn us in. We treated ourselves to lunch at Annie’s Tea Room where we naturally met Maffi and generally put the world to rights and the afternoon was spent on long overdue boat maintenance jobs. Joy touched up the paintwork on the rear doors whilst I fitted a vice to my workbench so that I could manufacture some turnbuttons from aluminium coat hooks (really!) to replace the broken wooden ones on our cratch table. Oh…and in the evening I beat Joy at Scrabble (hee hee!) but only by a few points.